Playing Rage 2 gave me flashbacks to playing Doom (2016). And that’s a very good thing. Remember when we were lukewarm about Doom? Remember when that project was stuck in endless development hell, and the franchise’s unimpeachable heritage was left to ride on the increasingly sour taste that Doom 3 had left in our mouths? Remember that dispiriting multiplayer beta, and Bethesda’s refusal to send out review copies, and those morbid quotes from Tim Willits? Remember how that game still managed to blow the roof off the place, wrapping us all in a giddiness that seemed absolutely impossible a few years back? 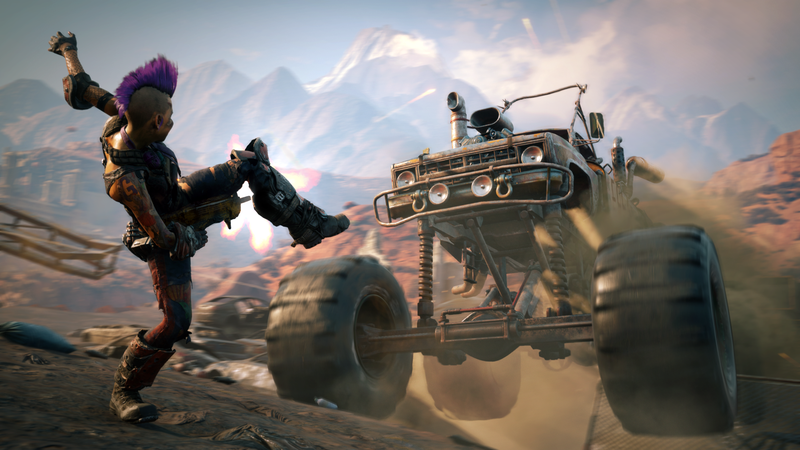 I’m trying to stay grounded, but if I’m being honest, I got a glimmer of that same miraculous feeling from playing a demo of Rage 2 at E3 this week. Rage isn’t even the most audacious reclamation project Bethesda has enacted this decade. That honor goes to Prey. Still, announcing a sequel to Rage in 2018 was pretty confounding. I’m not even sure that Rage has the cultural cachet to call itself the red-headed step child of the Id family. It’s more like a distant second cousin that periodically reminds you of its existence by its permanent presence in Steam seasonal sales. Why resurrect such a nonexistent legacy when you could break ground on a new IP? Or make a new Quake? Or do something more colorfully audacious, like a gritty Commando Keen reboot? The answer, as I found out in the 15 minute demo I played, is simple: You make Rage 2, because you can make Rage 2 feel like Doom. Rage 2 isn’t exclusively an Id project. The company is working on the game in conjunction with Avalanche, which is beautifully serendipitous when you consider that Avalanche put out a reasonably successful Mad Max game a few years ago. The PR liaison at my demo described Rage 2's design as a mashup of Avalanche’s exploration sensibilities and Id’s FPS tuning, and at least the second half of that proved to be true from the moment I entered the tutorial. The liquid-fast circle strafing, the big, broad-shouldered weight of the firearms, the heavy, heavy industrial soundtrack—all of that was in place, and all of it felt just as wonderful as before. I’ll give you an example: The level I played took place in an abandoned government space base in the middle of a crusty desert ridge, rife with mohawked jamokes raiding the wreckage. I whipped out my assault rifle and started firing, which filled up a God of War-style combo tally in the corner of my screen. Eventually, I was instructed to launch into something called “Overdrive.” Functionally, this was a standard “enrage” meter that increased my damage while also regenerating my health. But it’s the aesthetics that make it stand out: Overdrive sends a purple wave of synthetic energy over your screen, makes your bullets physically larger, and ratchets up the gore to esoteric levels of excess. After the demo I talked to a developer who told me that you can also air juggle dudes with your gunshots in overdrive, and if that’s true: Jesus. It’s the Doomguy button. It’s also responsible for the single most satisfying sequence I’ve had with a shooter this year. Every creative decision I noticed in Rage 2 felt like it was extrapolated out of the Doom wheelhouse. Your character is outfitted with a series of “Nanotrite” abilities, which have something to do with nanomachines and explain the superhuman action in the fiction. The quick-dash mapped to the left bumper lets you flank and counterflank with ease. There’s a seismic, jumping ground-pound thing called Slam which flattens entire squadrons at once. And there’s a quick melee bash called Shatter that sends goons in your way flying backwards. I imagine that Rage 2 will allow you to do a fair amount of customization with the Nanotrite outfit you bring into battle—at least, it seemed that way, given the empty spaces left on the HUD. As far as the conventional arsenal goes, I had access to that assault rifle, a ridiculously loud shotgun, and these outstandingly ghastly shurikens that helicoptered through the air before embedding themselves in an unlucky thug’s skull. All of it was presented in a deliriously cyberpunk flavor of the usual Dune-ified post-apocalypse: neon tattoos, graffiti, spiked leather jackets. If the biggest complaint about the first Rage was its lack of style, Rage 2 is making up for lost time. But here’s the thing. This is only one half of Rage 2—the Id half. There is an entire car-combat open-world exploration system—the Avalanche half of Rage 2—waiting under the surface that I didn’t get a chance to touch. I left the demo praying that the studio manages to refine the ideas they presented in Mad Max into something less janky. Hopefully, Avalanche will come out the other end with a substantial narrative crunch and an interesting mission structure that will give the standout shooting mechanics a nice home. If they can walk that tightrope, Bethesda might have something really, really special on its hands, and this mercurial, tertiary franchise might reinvent itself as a classic.